The response to, and interest in this publication was huge. This first edition publication was limited to 40 hand letter-pressed copies. We sold out of these rare copies almost immediately. We are very grateful to each of the individuals, libraries, museums, and educational institutions that purchased this book. In addition to sales, five of the books have been donated to people who supported the creation of the project..
We thank you again for your generous support and many kind words. DangerDot Publishing is very honored to celebrate the publication of “Thirty-Nine (39) Questions for White People,” by Naima Lowe, a stunning art piece and rare book that insists that readers reflect on the complexity of race, and the privilege to not have to notice it. 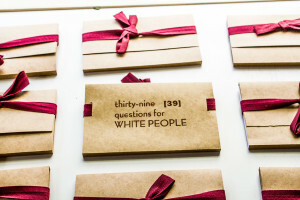 “Thirty-Nine (39) Questions for White People,” was recently featured at The Wing Luke Art Museum. 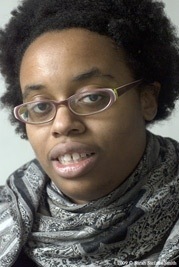 Naima Lowe is a 34 year old Queer, African-American artist and educator based in Olympia, Washington. Her films, videos, performances and writings have been seen at the Athens International Film and Video Festival, Ann Arbor Film Festival, Anthology Film Archive, The Knitting Factory, The Wing Luke Museum of the Asian Pacific Islander Experience, The Stella Elkins Tyler Gallery, The International Toy Theater Exhibition, and Judson Memorial Church. For more about the Naima, including contact information, please see here. Speaking engagements and engagement fees are available upon request.